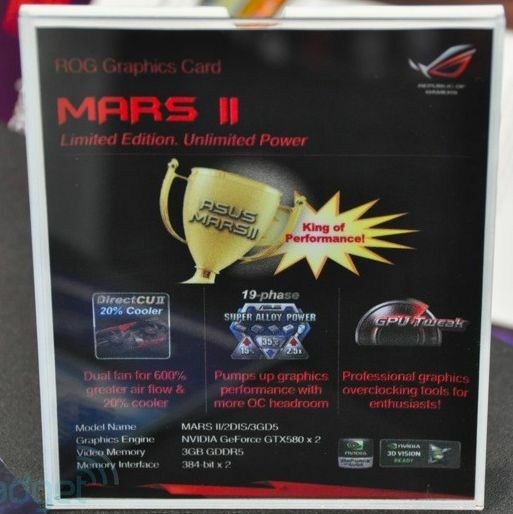 In my previous post about ASUS’s behemot, I said the max power draw of the MARS II was 525W. According to the guys at Engadget, the MARS II might consume around 600W. I suppose they wrote this because they got some information at Computex. 600W is more than the max power allowed by the PCI-E power connectors and so much power is certainly a peak 3D power under FurMark. In any case, more than 500W for the MARS II should be correct. Other information, only 1000 samples of the MARS II will be produced. Clock speeds of this true dual-GTX 580 are not yet finalized. (Update) ASUS MARS II Pictured: a three-Slot Behemoth for a real Dual-GTX 580! This is the result when a design goes horrible wrong! no, that would be the 590. This doubles as your House Heater during winter months..